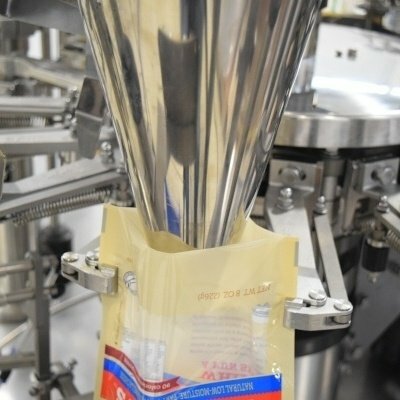 Automatic pouch filling and sealing machines are becoming increasingly popular today for their simplicity, ease-of-use, and the superior aesthetics of their finished product. 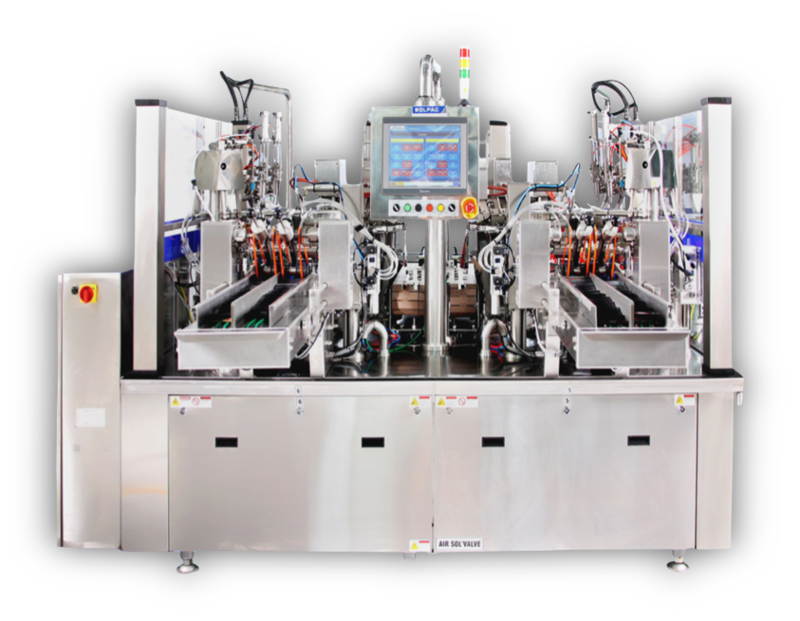 Whether you are new to packaging automation or are considering adding premade pouch packaging to your product lineup, you are probably interested in how these machines operate. Today we are taking a step-by-step look at the processes involved in turning an empty premade pouch into a shelf-ready finished product. Bag filling and sealing machines can be designed with an inline or rotary layout. For the purpose of today's article, we are diving deeper into the rotary layout. This design conserves plant floor space and is constructed with ergonomics top-of-mind, and thus is seeing more popularity than inline models. 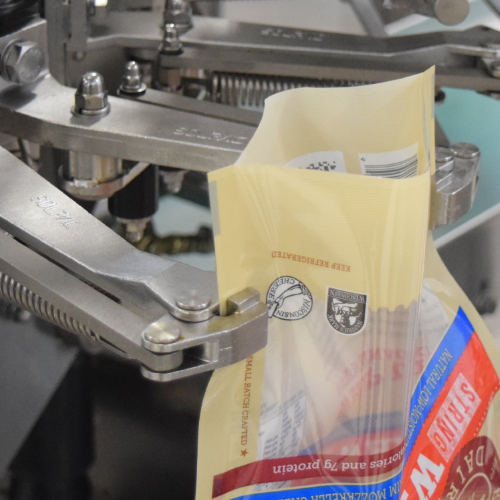 Preformed pouches are loaded manually by an operator into the bag magazine in the front of the automatic pouch filling/sealing machine. The bags are conveyed to the machine by a bag feeding roller. 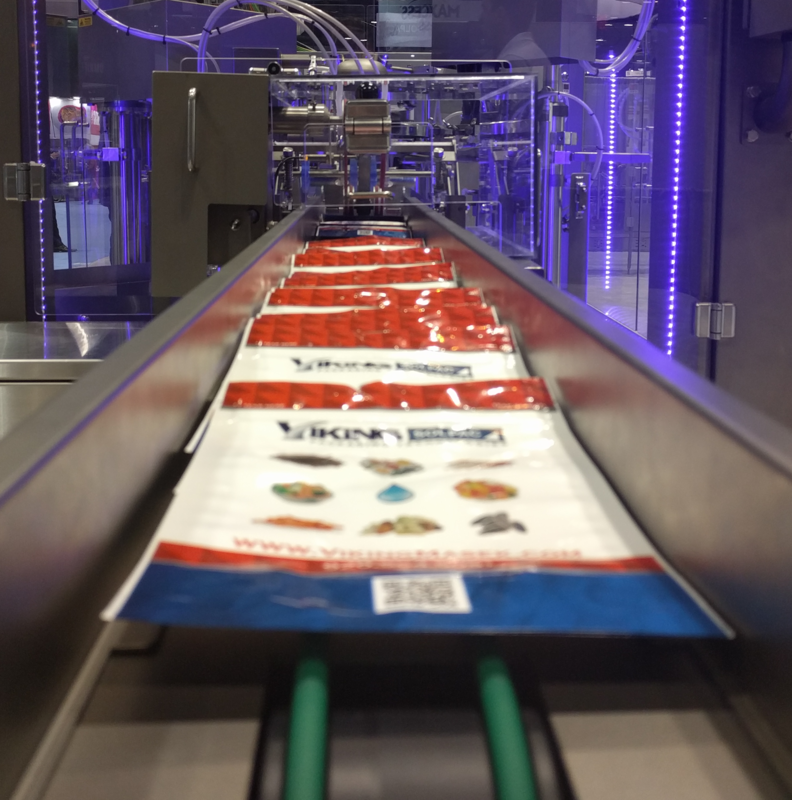 [UPDATE] In 2018, Viking developed a proprietary robotic bag infeed that completely eliminates much of the labor involved in properly loading and shingling premade pouches in the bag magazine. This robotic arm uses vacuum suction to grasp individual bags and load them into the bag gripping area. Contact us to see this technology in action. When a bag is detected by a proximity sensor, a vacuum bag loader picks up the pouch and transfers it to a set of grippers, which will hold the bag as it travels around the rotary unit to different 'stations'. These grippers can continually support up to 10 kg on the best bag filling and sealing machine models. If printing or embossing is desired, that equipment will be placed at this station. Pouch fill and seal machines can utilize both thermal and inkjet printers. The printer can place desired date/lot codes on the pouches. The embossing option places raised date/lot codes into the bag seal. If the bag has a zipper reclosure, a vacuum suction pad opens the lower part of the preformed pouch and opening jaws catch the top side of the bag. The opening jaws separate outward to open the top of the bag and the premade pouch is inflated by an air blower. If the bag does not have a zipper, the vacuum suction pads still open the bottom part of the pouch but only the air blower is engaged. Two sensors are present at the bottom of the bag to detect its presence. If a bag is not detected, the filling and sealing stations will not engage. If a bag is present but not placed correctly, it will not be filled and sealed and instead stay on the rotary apparatus until the next cycle. Product is dropped down a bag funnel into the bag, usually by a multi-head scale. For powder products, an auger filler is used. In the case of liquid pouch filling machines, product is pumped into the bag by a liquid filler with a nozzle. 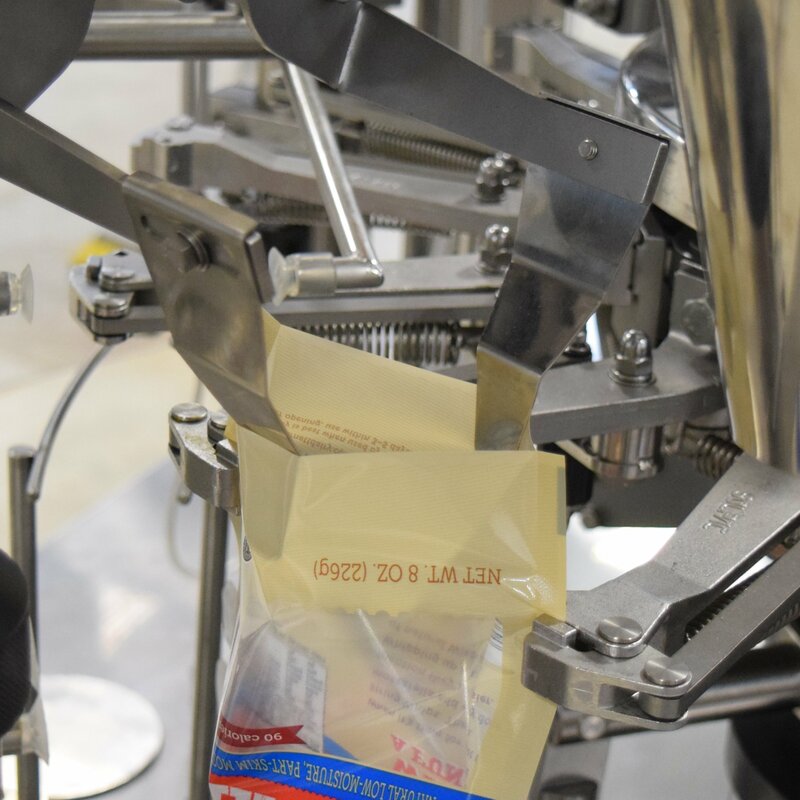 The filling apparatus is responsible for the correct measurement and release of discrete quantities of product to be dropped into each premade pouch. Gas flush. This modified atmosphere packaging (MAP) process displaces oxygen within the bag by using a blast of gas, usually nitrogen. This is done immediately prior to filling the bag with product to ensure maximum displacement. Dust collection. For dusty or messy products, a dust hood is placed above the filling station that collects airborne particles. Sometimes loose contents need to settle to the bottom of the bag before sealing. This station gently shakes the premade pouch to achieve that. Second liquid seal. For liquid/water pouch filling machine configurations, this station can be used for a second liquid seal to ensure maximum seal integrity. Second filling station. For products that include both solid and liquid components, a second filling station can be added here. Load shelf. For heavy fills, a shelf can be added after filling to bear the load of the extra weight and take the stress off of the gripping arms. Remaining air is squeezed out of the bag by two deflator components before sealing occurs. A hot seal bar closes on the upper part of the pouch. Using heat and pressure, the sealant layers of the premade pouch are bonded together to make a strong seam. A cooling bar passes over the seal to strengthen and flatten it. The finished bag is then discharged into a receptacle or onto a conveyor and can be transported to downline equipment like check weighers, x-ray machines, case packing, or carton packing equipment. 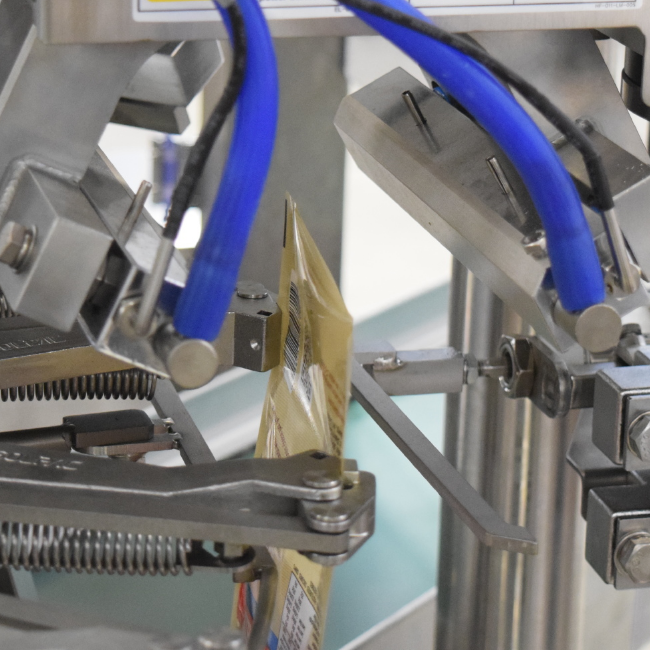 Interested in learning more about how automatic pouch filling and sealing machines can increase the diversity of your operations, help appeal to a new consumer demographic, and improve your bottom line? Not sure what to look for when shopping for this equipment type? Download our free guide.